Welcome to a Wanderluster’s love for food! The smell hit me like a Pepe Le Pew. I was confused because I know of this smell but being that is a tourist island, I didn’t think this fruit would exist. Following my nose, I ended up at a fruit stand where behold…. Durian! 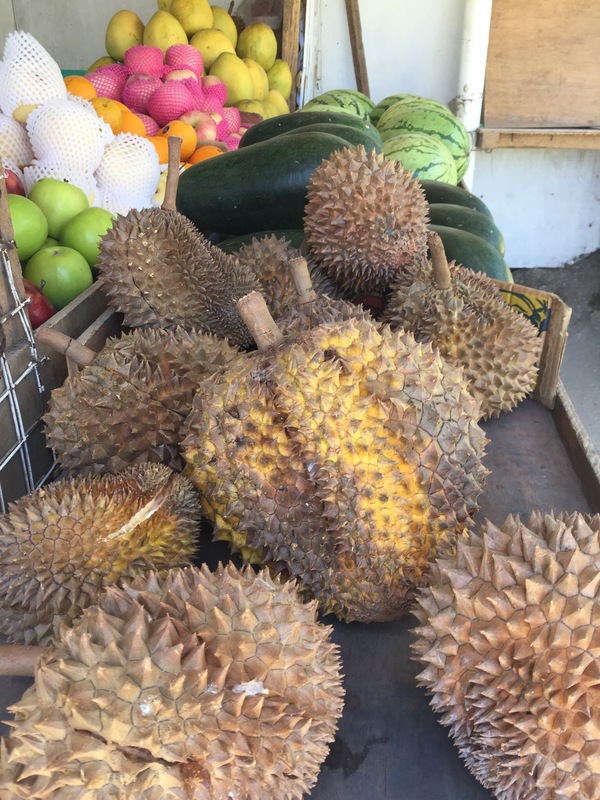 This large, husky, spiky yellowish brown in color is known as the “the king of fruits of Southeast Asia.” Originally founded in Indonesia and Malaysia, durian can weigh up to 2 to 8 pounds. Due to the strict need for tropical temperatures, durian can only be grown in Southeast Asia but imported the United States and Europe. Durian is packed with energy, vitamin B, C, minerals such as manganese, copper, iron, magnesium and potassium. It is known to help with depression, insomnia, digestion, blood pressure, cardiovascular health and sexual dysfunction. Either you love it or you hate it. It isn’t something that people have middle grounds with. The result of that, durian have been banned in many hotel establishments, public transportation, and airlines because the smell can linger for days after consumption. I found the fruit stand that had durian. Thankfully, I was able to buy a baby durian which was about 3 pounds. The fruit stand lady was nice enough to cut op the fruit and split it for me so I didn’t have to become a victim to the thorns. As I head back to the house, curiosity came with my friends. What is that smell? What is durian? Is that what we have smelling every time we passed D’Mall? What does it taste like? All I can say was… Try it. Either you love it or hate it. So everyone tried it. No loved it. One said it wouldn’t be too bad if it didn’t taste like the smell. One said it taste custardy but has this weird aftertaste. Good thing, I got the three-pound durian that only gave me three yellow, creamy, fleshy pulp fruit. My opinion: I love it…. it is a semisweet, creamy custardy flavor with lots of texture. It isn’t really anything else out there I can really compare it to. How did my love of durian start? It started at a young age. It was something that my mom ( my dad hated the smell of it) would buy once a year in the summer and I would be excited to eat it every time I had the chance to. Durian usually is imported to the US and can be found in Asian food markets. Usually frozen and expensive ( $6- $8 a pound), so nothing beats the taste of fresh durian. As anyone tried durian before? Yes! You made me try! Lol. Not soooo bad.